Friends of Music will host its Valentines Day Salon 5-7 p.m. Sunday, Feb. 17, at the Gatton Student Center. LEXINGTON, Ky. (Feb. 5, 2019) — Looking for a special treat the weekend after Valentine’s Day? 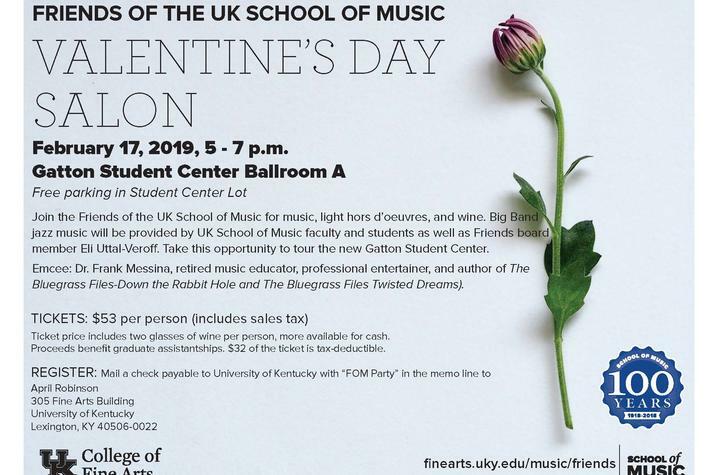 The University of Kentucky Friends of Music invites you to an evening of live jazz music, refreshments and fun at the Valentine's Day Salon. The event will run 5-7 p.m. Sunday, Feb. 17, at Gatton Student Center Ballroom A. Big band jazz music will be provided by UK School of Music faculty and students, as well as Friends of Music board member Eli Uttal-Veroff. Uttal-Veroff has an active freelance career as a bassist and serves as principal bassist for the Lexington Chamber Orchestra. The event will also bring musician and author Frank Messina to campus. A native of Brooklyn, New York, Messina holds a bachelor's and master's degree in music education from the State University of New York at Potsdam and a doctorate in education from University of Massachusetts Amherst. He served 16 years in the classroom as a teacher in elementary, middle and high schools. Messina, who has lived in Lexington for around 40 years, served four years as the content specialist in arts and humanities for Fayette County Public Schools. Most recently, he has begun a career as a mystery novelist, releasing his first two novels in 2018, with two more set to release in 2019. The Valentine’s Day Salon also will give people the chance to tour the new Gatton Student Center. Guests will snack on savory and sweet hors d'oeuvres and be given two drink tickets per guest. More beverages are available for cash. You may also pay with a check at the door. Parking for the event will be free at the Student Center and a coat check will be available outside of Ballroom A. For more information, contact Friends of Music President Martina Vasil at martina.vasil@uky.edu. The Friends of the School of Music is a volunteer organization of music lovers dedicated to financial support and advocacy for the UK School of Music. This event will raise funds for graduate student assistantships within the UK School of Music.